Self-regulation refers to the self's ability to control its own thoughts, emotions, and actions. Through self-regulation, we consciously control how much we eat, whether we give in to impulse, task performance, obsessive thoughts, and even the extent to which we allow ourselves recognition of our emotions. This work provides a synthesis and overview of recent and long-standing research findings of what is known of the successes and failures of self-regulation. People the world over suffer from the inability to control their finances, their weight, their emotions, their craving for drugs, their sexual impulses, and more. The United States in particular is regarded by some observers as a society addicted to addiction. Therapy and support groups have proliferated not only for alcoholics and drug abusers but for all kinds of impulse control, from gambling to eating chocolate. Common to all of these disorders is a failure of self-regulation, otherwise known as "self-control." The consequences of these self-control problems go beyond individuals to affect family members and society at large. 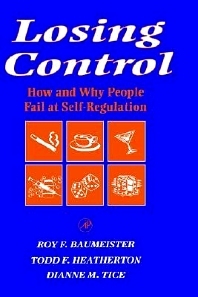 In Losing Control, the authors provide a single reference source with comprehensive information on general patterns of self-regulation failure across contexts, research findings on specific self-control disorders, and commentary on the clinical and social aspects of self-regulation failure. Self-control is discussed in relation to what the "self" is, and the cognitive, motivational, and emotional factors that impinge on one's ability to control one's "self." Researchers and students in social psychology and personality, and clinical psychologists. Basic Issues: Introduction: Self-Regulation Failure in Social and Theoretical Context. General Patterns and Mechanisms of Self-Regulation Failure. Controlling Thoughts, Feelings, and Actions: Task Performance and Self-Regulation Failure: Blowing It. Self-Management: Taking Care of Yourself. Thoughts Out of Control. Failure to Control Emotions and Moods. Controlling Impulses and Appetities: Impulses and Appetites. Alcohol Consumption and Abuse. Eating Too Much. Smoking. A Sampler of Other Behavioral Control Problems: Gambling, Shopping, and Aggression. Conclusion: Self Regulation: Propects, Problems, and Promises. References. Subject Index.